Vancouver, B.C……..Corvus Gold Inc. ("Corvus" or the "Company") - (TSX: KOR, OTCQX: CORVF) announces the latest assays from the final drill holes of the Phase II, 2012 Yellow Jacket drill program at the North Bullfrog Project, Nevada. The four hole program has now extended and further delineated the trend of the bonanza grade feeder system identified earlier in 2012. Best result to date was NB-12-138 which returned 72.4 metres @ 1.74 g/t gold and 98.7 g/t silver including 4.3 metres @ 20.0 g/t gold and 1,519 g/t silver (Table 1). The Yellow Jacket high-grade target area is located directly north of the currently delineated Sierra Blanca deposit. Results to date have not been incorporated in the current North Bullfrog estimated resource and updated preliminary economic assessment. Subsequent drilling is expected to add to the overall gold resource at North Bullfrog, and a global resource update, incorporating the Yellow Jacket target results, is planned for late 2013. The most recent result, Hole NB-12-184, intersected 58 metres @ 1.7 g/t gold and 33 g/t silver including 3.8 metres @ 4.1 g/t gold and 151 g/t silver, 4.4 metres @ 6.9 g/t gold and 50.4 g/t silver and 4.1 metres @ 4.3 g/t gold and 25 g/t silver (Table 1). The Yellow Jacket high-grade, fault controlled, gold and silver mineralization has been encountered over a strike length of approximately 700 metres and remains open on strike and at depth. 3D IP imaging has now linked the Yellow Jacket discovery to a large master fault system which extends for over 2 kilometres in length and could have significant potential for additional high-grade mineralization. In addition, recent detailed mapping, which utilized the new geophysical data, has now highlighted a number of other structural zones with similar signatures to the Yellow Jacket discovery and possible high-grade potential. Aggressive follow-up drilling of the Yellow Jacket system and several other targets is expected to commence early 2013. The most recent program, which commenced in October 2012, hit significant vein mineralization with broad zones of gold and silver mineralization hosting within it bonanza grade ore shoots which remain open on strike and at depth (Table 1). All vein intersections to date are within 150 metres of the surface (representing potential open pit mining depths) with quartz veins widening at depth (Figure 2), and none of these have been included in the current North Area estimated resource. The silver to gold ratio of mineralization in these veins is distinctly higher than the overall North Bullfrog resource estimate and could represent a major new silver discovery in the district which could significantly benefit the overall project. The Yellow Jacket target area is emerging as a significant new high-grade zone adjacent to the North Area deposit which could have a major impact on mining economics as a starter pit zone within the overall deposit, operating at a much higher grade with significant silver credits. Jeff Pontius, Corvus CEO, stated: "The near surface, high-grade Yellow Jacket zone not only offers an immediate positive impact on the North Area mine plan as a potential higher value starter phase, but also potential to evolve into a major new high-grade deposit in its own right. We believe the exploration potential for expanding the Yellow Jacket system and discovering new yet to be tested systems is high with our new understanding of the District. We at Corvus are very excited as we kick off our aggressive 2013 exploration and mine development program which will focus on expanding the high-grade and heap leach potential of the North Area as well as moving our Mayflower project through permitting and into planned development." The Yellow Jacket vein system represents a completely blind discovery of a large, previously unrecognized, high-grade gold and silver system in the North Bullfrog District (Figure 1). Prior drilling in this area was focussed to the east in an area of historic prospect pits along the Liberator and Yellow Jacket Faults, with RC hole NB-10-63 intersecting 10.7 metres @ 7.5 g/t gold and 6.5 g/t silver and core hole NB-12-126 intersecting 11.4 metres @ 4.9 g/t gold and 7.0 g/t silver. 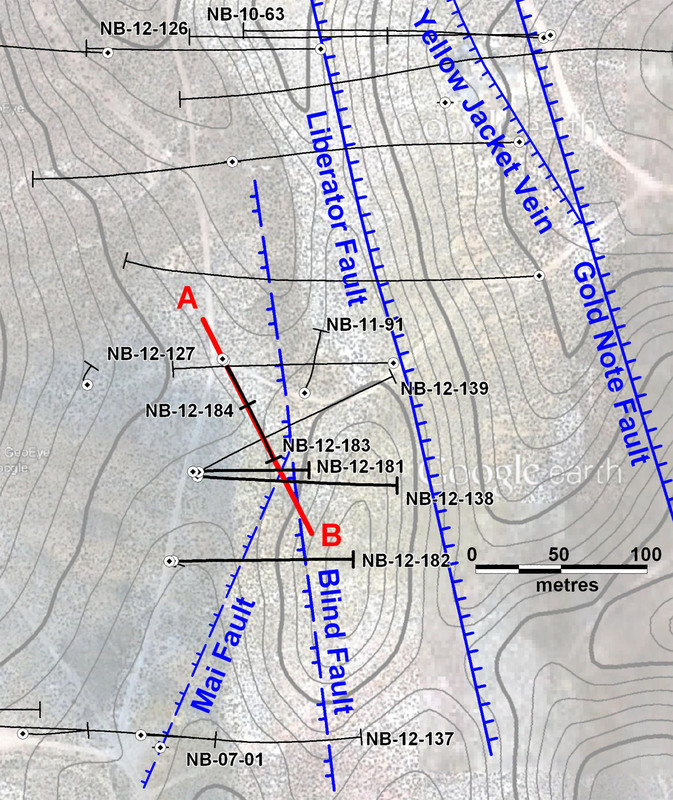 Core hole NB-12-127 (7.7 metres @ 2.4 g/t gold and 11.31 g/t silver) was designed to follow up on an interesting intersection in RC hole NB-11-91 (9.1 metres @ 2.07 g/t gold and 2.32 g/t silver) which was the first time quartz vein related mineralization was encountered. These results were used to target the hotter boiling zone part of the quartz vein system which lead to the Yellow Jacket discovery in hole NB-12-138 (72.4 metres @ 1.74 g/t gold and 98.7 g/t silver including 4.3 metres @ 20 g/t gold and 1,519 g/t silver). 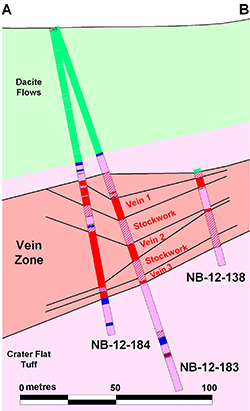 In the just completed 4 hole program, Hole NB-12-181 targeted the down dip projection of the veins in NB-12-138. However, structural displacements related to a NE-trending fault (now known as the Mai Fault) made it difficult to correlate the geology of the two holes (Figure 1, Table 1). Hole NB-12-182 was drilled approximately 50 metres south of NB-12-138/181 with the objective of better defining the location and nature of the NE-trending structure encountered in NB-12-181. This hole encountered stockwork veining with low-grade gold over significant intervals (Table 1) and succeeded in defining the Mai fault (Figure 1). Delineation of the Mai Fault allowed the plunge of the intersection of the Mai and Blind faults to be calculated and holes NB-12-183 and NB-12-184 were designed to drill perpendicular to the plunge of that intersection and successfully hit the target which appears to have an expanding vein system at depth that could hold the real potential of the system intersected to date (Figure 2). Figure 1: Plan of the Yellow Jacket zone showing the major structures and the drill holes related to the discovery of the high-grade vein system. Figure 2: Drill section in the plane of NB-12-183 and NB-12-184 showing how the geology and assays compare between holes (Table 1). including 108.6 110.4 1.8 1.9 6.0 Vein 1? including 127.5 131.6 4.1 0.7 50.8 Vein 2? including 139.9 144.0 4.1 4.3 24.6 Vein 3? *Intercepts are approximate true width and calculated with 0.2 g/t gold cut-off and up to 0.7 metres of internal waste. Corvus controls 100% of its North Bullfrog Project, which covers approximately 68 km² in southern Nevada just north of the historic Bullfrog gold mine formerly operated by Barrick Gold Corporation. The property package is made up of a number of leased patented federal mining claims and 758 federal unpatented mining claims. The project has excellent infrastructure, being adjacent to a major highway and power corridor. The Company's independent consultants completed a robust positive Preliminary Economic Assessment on the existing resource in December 2012. The project currently includes numerous prospective gold targets, with four (Mayflower, Sierra Blanca, Jolly Jane and Connection) containing an estimated Indicated Resource of 15 Mt at an average grade of 0.37 g/t gold for 182,577 ounces of gold and an Inferred Resource of 156 Mt at 0.28 g/t gold for 1,410,096 ounces of gold (both at a 0.2 g/t cutoff), with appreciable silver credits. Mineralization occurs in two primary forms: (1) broad stratabound bulk-tonnage gold zones such as the Sierra Blanca and Jolly Jane systems; and (2) moderately thick zones of high-grade gold and silver mineralization hosted in structural feeder zones with breccias and quartz-sulphide vein stockworks such as the Mayflower and Yellow Jacket targets. The Company is actively pursuing both types of mineralization. A video of the North Bullfrog project showing location, infrastructure access and 2010 winter drilling is available on the Company's website at http://www.corvusgold.com/investors/video/. The work program at North Bullfrog was designed and supervised by Russell Myers (CPG 11433), President of Corvus, and Mark Reischman, Corvus Nevada Exploration Manager, who are responsible for all aspects of the work, including the quality control/quality assurance program. On-site personnel at the project log and track all samples prior to sealing and shipping. Quality control is monitored by the insertion of blind certified standard reference materials and blanks into each sample shipment. All resource sample shipments are sealed and shipped to ALS Chemex in Reno, Nevada, for preparation and then on to ALS Chemex in Reno, Nevada, or Vancouver, B.C., for assaying. ALS Chemex's quality system complies with the requirements for the International Standards ISO 9001:2000 and ISO 17025:1999. Analytical accuracy and precision are monitored by the analysis of reagent blanks, reference material and replicate samples. Finally, representative blind duplicate samples are forwarded to ALS Chemex and an ISO compliant third party laboratory for additional quality control. This press release contains forward-looking statements and forward-looking information (collectively, "forward-looking statements") within the meaning of applicable Canadian and US securities legislation. All statements, other than statements of historical fact, included herein including, without limitation, statements regarding the anticipated content, commencement and cost of exploration programs, anticipated exploration program results, the discovery and delineation of mineral deposits/resources/reserves, the potential for the results at Yellow Jacket to increase the size of the current estimated resource at North Bullfrog, the timing of any updated resource estimate for North Bullfrog, the potential for there to be additional zones having the same characteristics as the Yellow Jacket high grade zone, the potential for the high-grade Yellow Jacket zone to have an immediate positive impact on the North Area mine plan as a potential high value starter phase, the potential for the high-grade Yellow Jacket zone to evolve into a major new high-grade deposit in its own right, the potential for the mining of the Yellow Jacket mineralization through open pit mining methods, the potential for subsequently discovered mineralization at Yellow Jacket to continue to have a higher gold:silver ratio than the overall deposit, the potential for any mining or production at North Bullfrog, the potential for Yellow Jacket mineralization to significantly benefit the overall North Bullfrog project, the potential for the Yellow Jacket target area to represent a significant new high-grade zone adjacent to the North Area deposit which could have a major impact on mining economics as a starter pit zone within the overall deposit and to operate at a much higher grade with significant silver credits, the potential for the existence or location of additional high-grade veins/mineralization at Yellow Jacket, the potential for the Company to secure or receive any royalties in the future, business and financing plans and business trends, are forward-looking statements. Although the Company believes that such statements are reasonable, it can give no assurance that such expectations will prove to be correct. Forward-looking statements are typically identified by words such as: believe, expect, anticipate, intend, estimate, postulate and similar expressions, or are those, which, by their nature, refer to future events. The Company cautions investors that any forward-looking statements by the Company are not guarantees of future results or performance, and that actual results may differ materially from those in forward looking statements as a result of various factors, including, but not limited to, variations in the nature, quality and quantity of any mineral deposits that may be located, variations in the market price of any mineral products the Company may produce or plan to produce, the Company's inability to obtain any necessary permits, consents or authorizations required for its activities, the Company's inability to produce minerals from its properties successfully or profitably, to continue its projected growth, to raise the necessary capital or to be fully able to implement its business strategies, and other risks and uncertainties disclosed in the Company's latest interim Management Discussion and Analysis and filed with certain securities commissions in Canada. All of the Company's Canadian public disclosure filings may be accessed via www.sedar.com and readers are urged to review these materials, including the technical reports filed with respect to the Company's mineral properties. This news release contains information with respect to adjacent or similar mineral properties in respect of which the Company has no interest or rights to explore or mine. The Company advises US investors that the mining guidelines of the US Securities and Exchange Commission (the "SEC") set forth in the SEC's Industry Guide 7 ("SEC Industry Guide 7") strictly prohibit information of this type in documents filed with the SEC. Readers are cautioned that the Company has no interest in or right to acquire any interest in any such properties, and that mineral deposits on adjacent or similar properties are not indicative of mineral deposits on the Company's properties.